Hezbollah leader responds with ambiguity to Netanyahu’s revelation that the group placed missile-launching facility near Beirut airport. 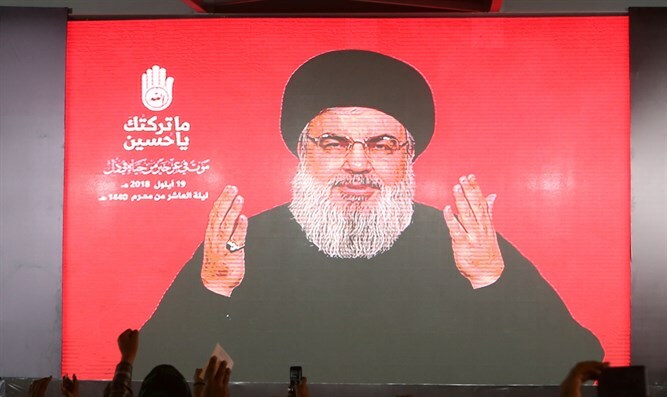 Hezbollah leader Hassan Nasrallah on Friday responded with ambiguity to Prime Minister Binyamin Netanyahu’s recent revelation that the terror group had placed a missile-launching facility near Beirut's international airport. Nasrallah's comments, quoted by The Associated Press, were his first since Netanyahu’s speech at the UN General Assembly last month, in which he revealed that Hezbollah, Iran’s proxy in Lebanon, placed three missile conversion sites alongside Beirut’s international airport, including in the Ouzai neighborhood, underneath a soccer stadium and adjacent to the airport itself. Nasrallah made no direct comment about Netanyahu’s allegations, only saying "we should not help the enemy in its psychological war against our country, people and government." Following Netanyahu’s speech, the Lebanese Foreign Ministry invited all foreign ambassadors in Lebanon to a meeting at its premises in order to respond to the allegations made by Netanyahu. Nasrallah’s deputy, Naim Qassem, said recently that Netanyahu's speech at the UN General Assembly neither interests nor threatens the terror group.